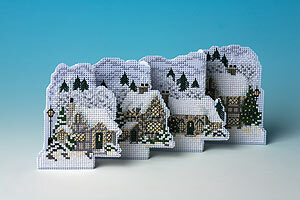 A row of cottages stand in the snowy landscape, dressed for the Christmas celebration with sparkling golden lights. Light Effects thread is used to give a frosty look to the distant trees and beads represent the Christmas Lights. This card stands 9 cms high and the kit includes everything you need to work this special Christmas card.